The two Winster cavers gathered around the dining table, accompanied by John, tea and cake. As we helped John with ideas for extra-curricular activities whilst on his business trip to La Réunion we waxed lyrical about the place, enthusing about the good times had during our previous trip, and also of the many places they had yet to visit. As John departed, borrowing the full complement of IGN maps, one thing was clear. Very clear. It was time for the long awaited return visit to the “Ile Intense”. Remarkably little time passed between that fateful meeting, and the booking of flights, followed by some careful planning. As before, it’s to be a train to London, the Eurostar to Paris, the 11 hour flight to St. Denis… And then it gets interesting. The plan is to travel with no more than can be carried in a rucksack each. From St. Denis a bus runs around the island. The aim is to take this as far as Bourg Murat, and then to hut-to-hut walk from there, to Piton de la Fournaise, and down the mighty Rivière des Remparts to the coast. From the coast there is (hopefully) a bus to Cilaos, a day of rest, and then a further 7 days of hut-hut walking via the 3000m high Piton des Neiges and into the Cirque Mafate, before returning to Cilaos for a day’s rest, and then home. The theory is that some pretty tough days (we do ~1500m of ascent on one day!) will be balanced by some easier days. At least one of us is hoping that the theory holds true! 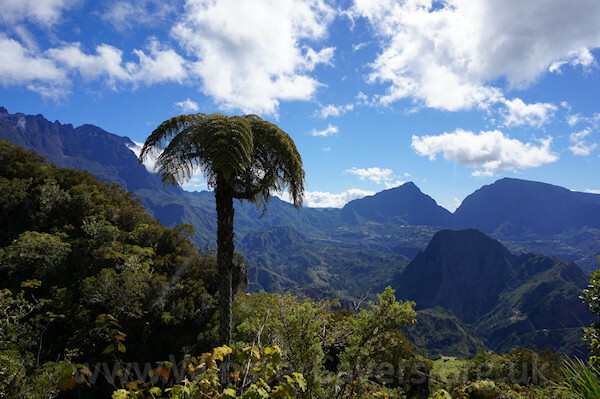 This, then, is the blog of the Winster Cavers’ return to La Réunion. Travelling light is going to be an interesting change for us, so in preparation for this, a bit of trial packing was in order… how else will one particular Winster caver know if it’s feasible to take a travelling guitar? As we worked our way through all the accommodation vouchers, trimming each sheet of A4 down to save valuable weight, it suddenly dawned that there was an important part of the logistical arrangements missing – like, errm, there was only one Eurostar ticket, not two!! The moment of realisation was closely followed by a moment of doubt, and then a short, but distinct moment of panic. Bargain seats were a tad scarce, but luckily it was possible to get an extra ticket on the same train, and with a bit of messing about, almost adjacent seats. There's always a little something that messes up your plans, isn't there? The lack of taxi availability to the station has been overcome, but more serious is that it's just come to light that the editor we use for the blog is stubbornly refusing to play ball with the requisite smartphone. This may or (probably) may not get sorted in time, so if there's a total lack of updates here, please look at our Facebook page... we'll post brief updates there and upload the full blog retrospectively if necessary. Don't you just hate technology sometimes! Train, train, Eurostar (train! ), Metro, OrlyVal, plane… And so, after about 24 hours of pretty-much non-stop travelling, the pilot announced that we were on our final descent. Out of the aeroplane window there was nothing to see but sea. Lots and lots of sea. And then, at the last minute, rising up steeply from the calm blue waters, was the tiny island of La Réunion – a mere 6500 miles away from home. There was a certain excitement to our new adventure, and with nothing more than we could carry comfortably in our rucksacks, we set foot on terra firma again. After a brief dialogue with the helpful chap at the information point, we caught the first of two “Car Jaune” buses to take us to the upland village of Bourg Murat. The bus service in La Réunion, as we soon discovered, is excellent - extremely cheap, with astonishing coverage. We spent a few hours at the brilliant “Maison du Volcan”, before setting out on foot to find our gîte for the night. The 1km or so walk to the gîte seemed worryingly tiresome, and our backpacks heavy. Mulling over our itinerary, there was a vague chance we’d bitten off a little more than we could chew. The gîte was pleasant enough, but our host was either unwilling or unable to cater for a couple of veggies – a certain short-sightedness that meant he lost out on two meals at €20 apiece. His loss, not ours, so we wandered back into the small town and found ourselves a restaurant that served us well whilst some local bloke with a nice voice and an out-of-tune guitar entertained us. We’d rather hoped, and had been led to believe, that there would be a bus running from Bourg Murat to the Pas de Bellecombe – i.e. to the huge caldera within which sits the volcanic peak of Piton de la Fournaise. The plan for the day was to take the bus part way, and then walk the latter stages to the Gîte du Volcan, thus easing us into our adventure gently. Our host at Bourg Murat assured us this was not possible so, not wishing to pay his friend’s rather pricey taxi offering, we donned rucksacks and prepared ourselves for a long walk. A very long walk. Catching a lift for the first five kilometres would have made all the difference, but it was not to be. And the fact that we saw not one, but two buses pass us as we walked along the small road filled us with a touch of disquiet. “Well that blows his TripAdvisor review”, was the not-so-tongue-in-cheek reference to the gîte in Bourg Murat. It is at times like this that the one of us that tends to hold the map and GPS has learnt to put a positive slant on the amount of distance left to cover. Letting on about the harsh reality ahead would not necessarily further the cause. But as we skirted around the head of the Rivière des Remparts and looked down on the impressive ravine (Tuesday’s route) we were reminded in no uncertain terms of the magnitude and splendour of this little island. Sleep heals many ailments, so we’re told. It doesn’t seem to do much for achy feet. If you insist on being fool-hardy and try to shortcut the route back by heading out over the fractures, here are two handy hints. Make sure you keep down-dip of the bright orange tape that delineates the so-called safe area from the most-definitely stupidly dangerous area that’s going to fall off the crater edge. You may not be surprised to learn that, after half an hour of fumbling around in the fog, dodging crevasses, peering over holes, etc, we returned to the “safe” viewpoint before heading back to the gîte via our outward route. And as we crossed the caldera on our return, the cloud mostly lifted and we got a welcome opportunity to warm up and dry out. That evening, as we dined with our fellow guests, we received some rather disturbing news. The Col du Taibit, a vital part of our route for our second hut-to-hut walk, was closed due to a landslip. With no simple alternatives, some serious re-thinking was going to be required. It was a crisp, clear frosty morning with cloudless skies as we set out on what we know was going to be a long day. Today we traversed the Plaine des Sables again, before dropping down into the mighty Rivière des Remparts. We’d thought that reversing the Plaine des Sables would be a bit of an anti-climax – we’d only walked it two days ago. But oh, how wrong we were. In the fresh morning light this was a whole new experience, and one to treasure. We made steady progress, mindful of the magnitude of the day’s undertaking, and arrived at the head of the Rivière des Remparts in remarkably good time. The path clung vertiginously to the edge of the valley walls. Somewhere, about 1200m below us and a good 5km away was, apparently, the village of Roche Plate. As we zigged and we zagged down the unendingly steep path, the rim of the Rivière des Remparts soon became a distant feature. And yet somehow, the valley floor didn’t appear to be getting any closer. We went down. And down. And down. It was a good hour before the homogenous mass of green below became close enough that we could make out individual trees. This was, in no uncertain terms, a big descent. As we progressed down, the path became more direct, heading out to the sea. But what took us by surprise was the approach to Roche Plate. A wonderful ravine of twisted lava, deep plunge pools, and lava tubes. And then a path so beautifully adorned with tropical plants that it had every appearance of a well-tended botanical garden. This was top quality walking, and we would heartily recommend it. The Gîte du Rivière des Remparts is also beautifully located. Clean, tidy and with a congenial host who catered for our veggie habits wonderfully. We were going to sleep well that night. Heading South from Roche Plate the small, muddy lane passes through yet more wonderful scenery. The botanical garden that is that part of the Rivière des Remparts makes for fantastic walking. And as one descends, the valley starts to open up and level out - to become an impressive, rocky dry riverbed. Here, sadly, things go a little awry. The river bed is being very actively "mined", that is, a company is taking stone from the river bed for use as aggregates, building stone, etc. To be fair, when they're finished, the landscape will recover well. But the constant and very frequent lorries passing by, laden with stone, took away the peace and tranquillity the valley deserves. Despite the works, the valley is still impressive and worth walking, but we would advise saving it for a Sunday when the lorries are not running! Our long walk out completed, we arrived at the bus station at St. Joseph in good time. Three buses later we arrived at the beautiful Hotel Tsilaosa in Cilaos. We reluctantly came to the conclusion that returning to Cilaos for our final two days was not going to be possible, and that we should exit the Cirque Mafate to the North. Apologetically we cancelled our final two nights stay at the hotel Tsilaosa - thankfully the staff were very relaxed about it, and clearly so busy they were going to have no difficulty in re-letting our room. Pacing ourselves, we set off in glorious sunshine - walking steadily through the small town of Cilaos towards the huge vertical walls of the Cirque du Cilaos. Today was to be one of our big days - the 1200m+ climb to the Refuge Piton des Neiges (aka Caverne Dufour). And then the climb for real... 1100m of narrow zig-zags, rising unrelentingly from Cilaos to the col at Caverne Dufour. We zigged, and we zagged, again and again, with each step taking us steadily further away from Cilaos, and closer to the summit. And with each view getting bigger, and wider, and more impressive. Stops for water, and breath, were frequent but brief, each allowing a quick check of our altitude on the GPS... 1600m, 1700m, 1800m. The buildings in Cilaos became ever more distant, mere pinpricks on an immense horizon, with the deep blue sea more than 2000m below us. To our surprise, the gite was open, so we booked in and had a well-earned cuppa. As we lay our kit out on our bunks, the wind rattled the doors and windows - there was a very real chance that the weather was on the turn again. And if it did turn for the worse, our planned ascent to the summit of Piton des Neiges for sunrise might be an unpleasant undertaking. Before long the decision was made. We left all non-essentials at the gîte, donned rucksacks & boots again, and started out for the summit. The lighter rucksacks meant we made good time, and after ascending another 650m we summited in clear but windy weather shortly before sunset. Magnifique! With the light starting to fade, and the 18:30 evening meal time approaching fast, we swiftly descended, to the cold, basic, but functional gîte and our disappointingly-not-quite-veggie répas. Clouds enveloped the gîte as effectively as the darkness. The wind shook the doors and windows. The rain drummed on the roof (and leaked under the doors). But having done 1850m of ascent that day, and 650m of descent, we were, without doubt, going to sleep that night! At 4:00am, as expected, we woke to the dulcet tone of someone's alarm clock, and the fidgetting and rustling of a bunkroom full of hikers preparing to climb to the summit for sunrise. As the wind and rain continued to batter the gîte, we remained almost motionless in our bunks, satisfied we had made the right call yesterday. Climbing to the summit in that weather was going to achieve little. By 9:00am the weather was showing no sign of improving. With no option but to move on to our next gîte, cloaked in our waterproofs we set out for Belouve. Three hours were spent walking rapidly along what was probably a spectacular ridge - but with visibility down to no more than 20 yards, it was hard to tell. Three hours, of dodging puddles, and boggy swamps. Three hours with our heads down, trying to make the most of what little shelter the few shrubs afforded. Three hours of - walking in completely the wrong direction! As the rain eased, we dared to get the map out of the rucksack. It wasn't that we'd misread the map - we simply hadn't looked at it before we set off. There was a remarkable lack of expletives as the reality of our situation became apparent - our mistake had added an extra 10km to an already long day. The revised plan was a "short cut" towards Belouve - muddy, steep, wet, and not very short. After another two hours we reached a forestry track - clearing skies and warming sunshine staring to dry out our rather soggy jackets and boots. We walked purposefully along the track, already tired, with over 13km left to go. Down to the road, left turn, keep going. As we did so, one slightly-disillusioned Winster Caver decided to try thumbing a lift. Much to our delight, the first car to approach stopped - and a very pleasant pair of German tourists gave us a ride all the way to Belouve. Result! We are most grateful for their kindness! Whereas the Caverne Dufour is most definitely "basic" accommodation, the Gîte du Belouve is at the other end of the spectrum. Warm, comfortable, good showers, excellent food. And very, very welcome. One of the highlights of hut-to-hut walking is the evening répas - all the guests sitting down together for food, drink, and an exchange of stories and information. Here we learned that the signs saying that the Trou de Fer was closed could be ignored - there was an easy way round. So without further ado, we set out on "plan A" for the day - a walk through the Forêt de Belouve to the Trou de Fer, followed by the descent to Hell Bourg. The Forêt de Belouve is beautiful, and through it run a series of excellent paths. But after yesterday's extended downpour much of our chosen route out was, frankly, a horrid muddy swamp - and progress was slow as we dodged muddy obstacle after muddy obstacle. But the effort was truly worth it - the Trou de Fer is a colossal "cirque", lushly green with waterfalls a-plenty - a photographer's paradise. We returned to the Gîte de Belouve via a rather easier route - and paused to take in the views over Hell-Bourg some 500m below us. From here we could also see out towards the Cirque Mafate. Tuesday's route from Hell Bourg to La Nouvelle looked like a long, long way. On our previous visit to Hell Bourg we hadn't really taken to the place, but as we approached through the dense bamboo forests, the charm of this small town was immediately apparent. Here we have two nights in the somewhat more upmarket hotel "les Jardins d'Hèva" ... And tomorrow is a day of rest. There was no rushing around to be done today, but one task of great importance - to sort our last two day's walking and book accommodation. The two girls in the Maison du Tourisme were exceptionally helpful, and very patient. We settled on keeping with our original plan as far as Marla, and then heading North to (the other) Roche Plate - spending a night there, then exiting the Cirque Mafate by climbing the 1100m to Le Maïdo. It was only the last night's accommodation that proved tricky to arrange, but we got there in the end. A short-but-steep late afternoon walk up to the waterfalls at the "Trois Cascades" left us in no doubt as to how tired our little legs were. In fairness, we were expecting this to be a long day. And it was. We started by taking the local bus out towards Piton d'Enchaing. It was only 2km, but it was also only €1. And that 2km could well have been what made the difference between achieving that day, and not. At the start of the route proper we had a choice - the main GR1, or the GR1 Variante via the Trou Blanc. We opted for the latter - it looked like the more interesting route. An indeed it was, but as the initial forestry track climbed steeply we soon started to doubt if we'd made the right choice. Our rucksacks weighing heavy on our backs, our legs fatigued from several days walking, the heat of the day almost overwhelming, we walked. Up, down, up, up, down, up, down... wow - this was going to be a day to test our resolve. On arriving at the Trou Blanc it took a little while to find our route - which thankfully was pointed out to us by some helpful canyoneers. The paths were wonderful and varied, and we kept going, and going, mostly, but not exclusively, upwards. Through dense woodland, across pristine open rivers, on vertiginous paths that clung to precarious cliff faces. This was a truly fantastic route, full of surprises. As we climbed towards the Col de Fourche, our gateway into the Cirque Mafate, the cloud base became ever closer, and by the time we'd reached 1800m altitude, visibility had dwindled and the air was decidedly moist. We pushed on, ever upwards, mindful of the fact that time was getting on and that we still had a fair way to go. We'd been walking for 7 hours or more before we reached the col, some 1200m above our start point. From here we sort-of knew the route, as we'd walked out from the Cirque Mafate via the Col de Fourche on our previous visit. La Nouvelle was still a good two hours away, but thankfully on mostly-easier terrain. With a certain sense of "I need a beer", we marched on through the tamarind forests - La Nouvelle seemingly an age away. The Gîte Tamareo, our accommodation for that night, took a bit of finding, but it was worth it. Clean rooms, comfortable beds, a congenial host, and a cool chef dude that cooked up a fab veggie curry specially for us. Not to mention the generous (and very welcome) glasses of home-made "rhum arrangé".....! 19km distance. 1600m ascent, 750m descent - two very tired hikers! Today was a well-planned "rest" day - just a few kilometres of relatively easy terrain heading South from La Nouvelle to Marla. After yesterday's efforts, it didn't, however, feel much like a rest. The flat bits were OK. The downhill bits were OK. But when it came to propelling one's self uphill, that was another matter altogether! Thankfully, we had all day and were in no rush - we strolled leisurely through the breathtaking scenery of the Cirque Mafate - pausing for a while down by the riverside. Pausing for a while for photo stops. Pausing for a while - because we could. And because, frankly, we needed to. We arrived in Marla in plenty of time, stopped off at the Snack-bar Marla for a couple of well-earned beers, and crashed out in the sun for a while before finding our gîte for the evening. When we walked in the Cirque Mafate back in 2009, the leg from Roche Plate to Marla stood out as being one of the more memorable days - harder than anticipated, but full of surprises and great situations. However, repeating that route, albeit in the opposite direction, was definitely not part of our original plan. As we walked out from Marla under a clear blue sky, descending steeply towards the river bed, the route had a certain familiarity. And yet somehow, walking in the opposite direction from before meant that everything was new. New views, new experiences, new situations. There were even new cats by the waterfall at the Trois Roches (clearly from the same gene pool as the ones we'd seen previously!). Their eagerness to partake in our lunch was familiar though! From the spectacular lunch spot of Trois Roches, the path crosses the river just upstream of a truly enormous waterfall. Climbing in and out of not-so-small gullies, the path then clings to the 1000m high caldera edge, high up above the ever-deepening ravine, into which one can never quite see. 11km later, with 400m of ascent and 900m of descent behind us, we arrived in Roche Plate in good time. The gîte where we'd stayed before was all closed up - but just beyond it the snack bar was still open. We grabbed ourselves a beer and relaxed for a while, before tracking down our accommodation for the night. Now, whereas the Gîte Tamareo was most definitely at the "luxury" end of the mountain-hut scale, as our near silent host Juliette showed us to our bunk room, we struggled to hide our (albeit mild) disappointment. In reality the place was fine, but we'd sort of gotten used to a certain level of comfort! We chatted for a fair while with our fellow guests over a couple of beers... but as 6:30 came and went, there was no sign whatsoever of our "répas". No cutlery emerged, no plates. No glasses, no "punch du maison". No smells of cooking, no noise from the kitchen. And, we feared, no chance at all of our veggie requirements having been understood. And then, just as we were debating as to whether the final bag of crisps was going to suffice as our evening meal, Juliette emerged. A generous bottle of "rhum arrangé" was placed on the table, followed by a veritable feast - including our favourite "carri d'oeuf". Fantastic. Friday 12th September - Roche Plate to Le Maïdo. From Roche Plate, the viewpoint at Le Maïdo is, as the crow flies, little more than a mile away. Add in the zig-zags and it becomes an 8km (5 mile) walk - with 1100m of ascent. We set off as early as we could, hoping to get the larger part of the ascent done before the sun got too strong. The route started out through thick pine forest level at first, before climbing up to "La Brèche" - our junction, a view point, and an off-balance path that was barely managing to cling to the steep sided caldera walls. High above us we could see up to the view point - only another 750m of ascent to go! To our surprise, what we thought was going to be a gully turned out to be a huge rib of rock, with our path tentatively strung out along its narrow, exposed spine. We climbed steadily - upwards, upwards, upwards. Pacing ourselves, and stopping often for small sips of water. It was a hot day, and shade seemed to be in short supply. And as we climbed, we could start to make out the continuation of the path beyond the rib - a thin line drawn high upon the cliff face. To our left was the near vertical caldera wall, to our right, a near vertical drop of several hundred metres, and immediately beneath our feet - a steep and narrow path, in places less than a foot wide. This was not a path for the faint-hearted! After just 3 hours walking we reached the caldera edge - out of water, dehydrated, and full of adrenalin. 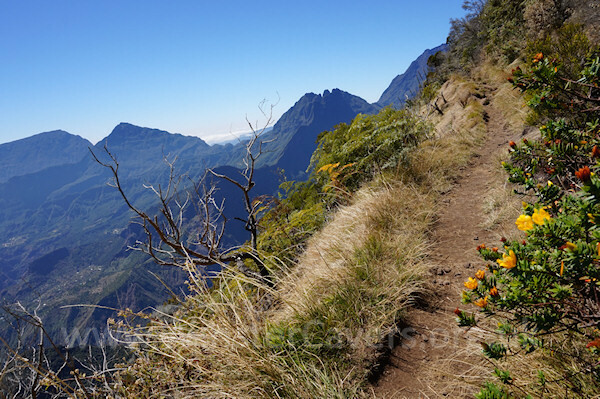 Whilst it wasn't what we'd originally planned, it has to be said that exiting the Cirque Mafate via Le Maïdo is a most exhilarating way to end two weeks of sustained trekking. Almost bob-on time, our bus arrived and we hopped aboard for the ride down to Saint-Paul on the coast, and then to our final night's accommodation - a Chambre d'Hôtes near Bois des Nèfles. Here, a wonderful night was spent sharing stories and songs in the company of our hosts at Le Ruisseau.